Flukes is a lovely novel. Sweet and adorable will most likely be the first two words to pop into any reader's head whenever their thoughts turn to Nichole Chase's latest YA novel. Meena lives in the Bahamas with her adopted parents, helping them run their animal shelter, Flukes. Since she's been home schooled her whole life, her biggest worries aren't bullies or boys, but the secret she's hiding. That dynamic changes the moment she meets Blake. Blake is assigned to work at Flukes because of an incident that leaves community service as his only option if he wants to receive his high school diploma. While Meena may believe that staying away from Blake will protect her secret, she learns that maybe her secret isn't in too much danger with him. Flukes flows at a very quick pace filling readers up with romance and mysticism. Blake and Meena ruled this story and every moment that Chase spends on their growing relationship is well spent. 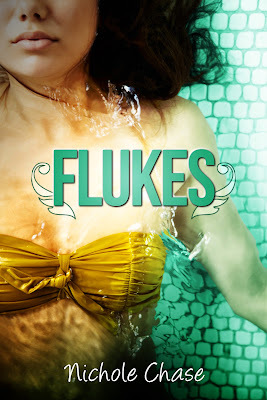 However, for readers who love the catch of suspense and strong hints of danger, Flukes doesn't have much of either. The limited amount of conflict in the plot gives the story a breezy feeling, as if anything bad that might happen will be very easy to overcome. Out of the whole novel there's just two or three scenes that provide real conflict in either Meena or Blake's lives and they're short-lived or too simple. The impact could have been much greater on the intensity of the plot, if Chase expounded when it came to relating the issues to readers. Meena's sweetness coupled with Blake's protectiveness takes the novel's romance to a warm, cherishing level. Chase's characters are strong and humorous, giving Flukes a lightness that will make readers sigh with contentment throughout the story. Thank you for being part of the Flukes tour! I really appreciate it!